Welcome to Maple Shade Bed & Breakfast in Saratoga! The Maple Shade is a unique Bed and Breakfast in Saratoga NY located on 85 scenic acres and only 10 to 12 minutes from downtown Saratoga Springs. 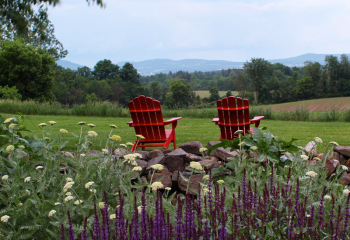 The Victorian farmhouse was built in 1875 and sits between the Adirondack foothills and the Green Mountains of Vermont. Between 2001 and 2007, the original structure was renovated with the modern conveniences of today while maintaining its charm of yesterday. Original details of the home have been restored and reused, while modern amenities are present such as central air conditioning, wireless internet access, cable TV and private baths. Breathe in the clear, country air, enjoy the beauty nature has to offer and unwind from the stress of everyday life. 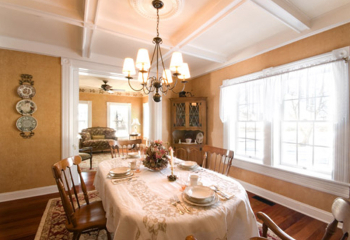 At Maple Shade Bed and Breakfast, a peaceful atmosphere awaits both the vacationer and the business traveler. We are here to make your visit relaxing, romantic and enjoyable. Elegant, spacious rooms await you. Each morning a delectable breakfast is served with hot coffee and tea to start your day. Browse through the many brochures to plan your day. When you return kick off your shoes and unwind by the warmth and ambience of one of the fireplaces or relax on the front porch with a beverage and snack from the guest kitchenette. Come and experience a bit of heaven. 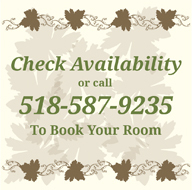 Call 518-587-9235 today for more information on planning your getaway and to book a room at Maple Shade Bed & Breakfast!